No light without dark… no good without evil, no loud without quiet, no Yin without Yang. This interplay has a supporting role within the musical creations of LUNA RISE. 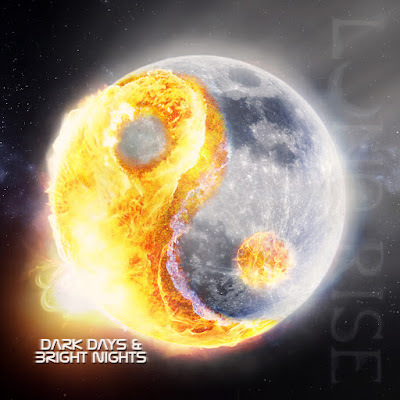 Specifically when it comes to the conceptually thought out current debut album “Dark Days & Bright Nights”, whose front cover is decorated with a merging Yin Yang, consisting of moon and sun. Each dark day is followed by a brightly lit night. This is something Chris Divine – singer and leader of the band – sings about, at the same time reflecting the one ore another liminal experience he lived trough. The music of LUNA RISE could sound like having Bon Jovi, Billy Idol, Ozzy, Dave Gahan and Neil Armstrong locked in a room with instruments – during full moon of course. The band’s name containing “Luna” (lat. moon and Roman goddess) refers to a conscious game with mystique and atmosphere. The music does also come with numerous facets and influences from classic Hard Rock, Progressive Metal, Goth-/Dark Rock, up to melancholic-sensual Pop with some catchy ear worms. Flyah really enjoyed listening to Dark Days and Bright Nights. The music is something original and really reflects the Yin and Yang concepts. With dark lyrics that show the pain of life and struggles of love with deep emotion, Luna Rise can bring a substance like no other. The lyrics may show the depressing side of relationships and thought but the calming pop sounding instrumentation with gentle rhythms make this album very addicting . This band could be compared to other great groups like ''Three doors Down'' but they are definitely no copy cat. The guitar riffs of songs like Demons Inside you can really hear the influence of Gothic genres. The thing I like the most about Luna Rise is the mixing and mastering of Dark Days and Bright Nights. Things like reverberation, filtered vocals and perfect leveling make this album very smooth to listen too. If I had to rate on a scale of 1-10 this band will be above 7. Their video really reflects motif and mantra. There is good times and bad but one thing I can say they show the complex structure of both sides;cause and effect.